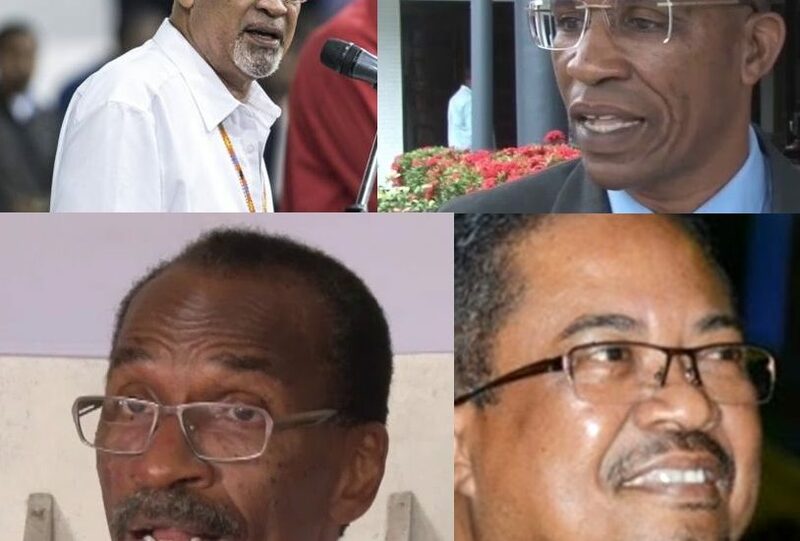 PARAMARIBO — As Suriname is gearing up for the 2020 General Elections, the political rhetoric would be the funniest April Fool’s joke if it were not true: politicians caught up in a war of words over who compares to the fiercest animal. It all started when, at his kick-off 2020 rally at his party headquarters in Paramaribo on Friday, President Desi Bouterse said in a metaphor that his National Democratic Party is a “A Tiger that is Awake!” “Go ahead if you want to underestimate us, but do so at your own risk,” he said, as he promised a continuation of a list of projects that have been carried out since he took office in 2010. But then opposition Parliamentarian Edward Belfort (ABOP), who from his time as an unforgiving policeman still bears the nickname “Tigri Barba” (Tiger’s Beard), took offense. “How come all of a sudden Bouterse is the Tiger? Everybody knows that I am the real Tiger with the Beard that you do not dear to stroke,” Belfort charged on Saturday. 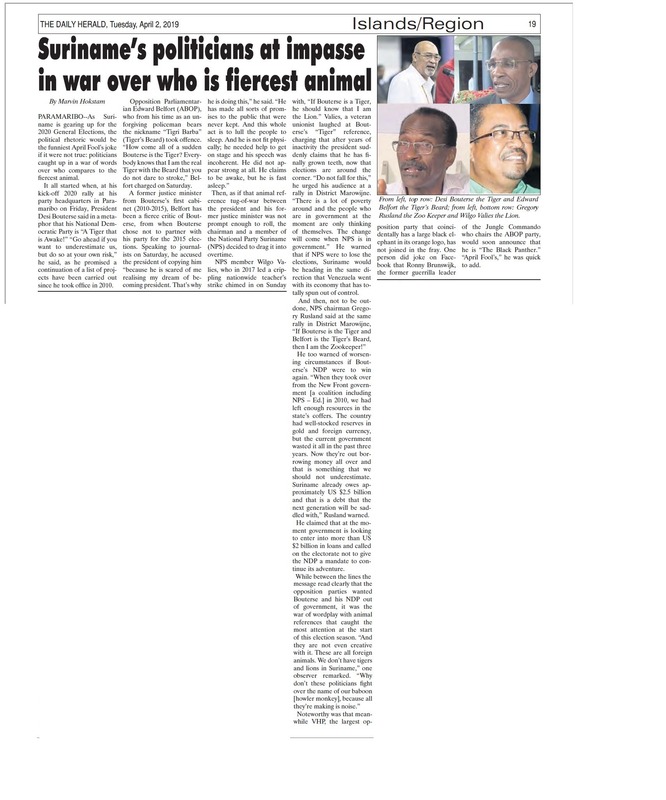 Then, as if that animal reference tug of war between the President and his former Justice Minister was not prompt enough to roll, the chairman and a member of the National Party Suriname (NPS) decided to drag it into overtime. NPS member Wilgo Valies, who in 2017 led a crippling nationwide teacher’s strike, chimed in on Sunday with “if Bouterse is a Tiger, he should know that I am the Lion.” Valies, a veteran unionist laughed at Bouterse’s ‘Tiger’ reference, charging that after years of inactivity the President suddenly claims that he has finally grown teeth, now that elections are around the corner. “Do not fall for this,” he urged his audience at a rally in District Marowijne. “There is a lot of poverty around and the people who are in Government at the moment are only thinking of themselves. The change will come when NPS is in Government.” He warned that if NPS would lose the elections, Suriname would be heading in the same direction that Venezuela went with its economically that has totally spun out of control. He too warned of worsening circumstances if Bouterse’s NDP would win again. “When they took over from the New Front Government (a coalition including NPS .ed) in 2010, we had left enough resources in the state’s coffers. The country had well stocked reserves in gold and foreign currency, but the current Government wasted it all in the past three years. Now they’re out borrowing money all over and that is something that we should not underestimate. Surinamealready owes approximately US$ 2.5 billion and that is a debt that the next generation will be saddled with,” Rusland warned. He claimed that at the moment Government is looking to enter into more than US$2 billion in loans and called on the electorate not to give the NDP mandate to continue its adventure. Noteworthy was that meanwhile VHP, the largest opposition party that coincidentally has a large black elephant in its orange logo, has not joined in the fray. One person did joke on Facebook that Ronny Brunswijk, the former guerrilla leader of the Jungle Commando who chairs the ABOP party, would soon announce that he is The Black Panther. “April Fool’s,” he was quick to add.